The correlation isn’t perfect, of course. Oil was relatively cheap between 1986 and 2003, due to a relative abundance of supply as Saudi Arabia and new fields ramped up production, with two periods of extreme price action: a brief spike higher in 1990 preceding the First Gulf War, and a collapse to $17 in the 1998 Asian Contagion financial crisis. 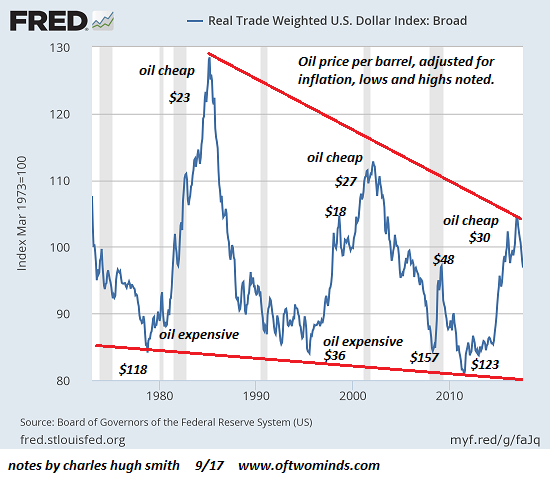 Geopolitical crises, wars and supply shocks will move oil prices regardless of the value of the USD. That said, it’s clear that absent such shocks, there is a strong correlation between a stronger USD and lower oil prices (in USD of course) and a weaker dollar and higher oil prices. At some point, the price of oil might start mattering to households and businesses. 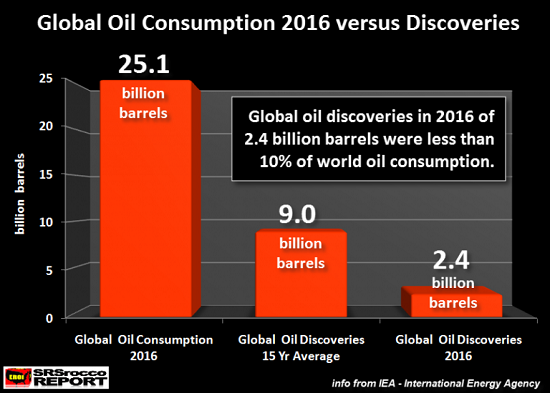 Note that the discoveries of oil are now a thin slice of annual consumption. 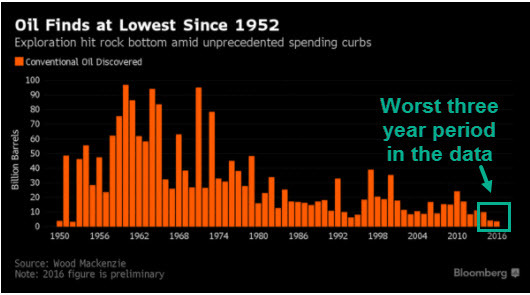 As the cheap oil is depleted, what’s left is the costlier-to-extract stuff.